Hello & welcome to The Story Bazaar! Welcome to The Story Bazaar web-site and blog! You’ll find lots of information here, about ‘The Story Bazaar’, its books and what is happening in the world of the bazaar. The site is only in its early stages as yet, so please bear with us while we attach all the customary add-ons, a subscribers list, some pictures etc. This week I’ve been to the Battersea Antiques and Decorative Arts Fair in a frosty Battersea Park, looking at beautiful objects. Some were old, some less so. Much of the furniture was exquisite and I coveted many pieces, which were well outside my budget. 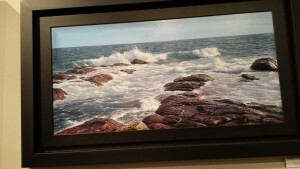 In particular I discovered and fell in love with two paintings by a contemporary artist named Esteve, whose remarkable seascapes were so realistic that I initially mistook them for photographs. The incredible technique of the artist made the water seem so real that you could almost feel the salty spray as the waves hit the rocks. Like all the very best paintings, each time I looked at it, it offered up something new. Rather like watching the sea itself. At the less costly end of the market there was lovely antique glass, medals and insignia, probably no more expensive that can be found at some auction rooms and flea markets. A market, or, more specifically, a car boot sale, figures in the first story in ‘The Village’ short story collection, when a casual browser finds an object on someone’s stall which he recognises. Its purchase prompts him to search for more evidence of his family’s past. The Battersea Antiques and Decorative Arts Fair runs until 25th January and invitations for entry can be had, for free, on its web-site. I came across it through the Tate magazine and am not affiliated to it in any way. Happy browsing. This entry was posted in Culture Vulture by juliej. Bookmark the permalink. Julie, what a brilliant concept. Very impressed! Looking forward to reading your book come April. I think I’ve read just about everything on the site at the moment, and it is so impressive. And the idea, the concept, probably even more so. Well done for this initiative. I’ll follow with great interest, especially articles on Spain, London history and architecture – all long-standing interests of mine. Keep up the good work!